1st disc. Go to "Special Features" and then go to commentaries. Push to the side to highlight the Meatwad igloo for deleted scenes. 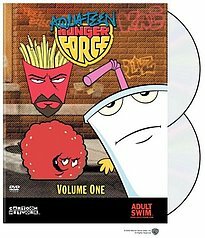 On the second disc the main menu, highlight Frylock's eyes and Shake's straw for more deleted scenes. Insert the second disc. Go to episodes. Go to "Play All" and push up to highlight the 103 sign. You will get "Assisted Living Dracula". On Disc 1 go to "Special Features" and push to the side to highlight Carl's chain for deleted scenes.